Marathon Ontario is located in the furthest northeast corner of Lake Superior. It is the first harbour of any size northwest of Michipicotin Harbour. However, it really isn't a destination harbour as facilities are scarce and using the harbour is awkward because of the restrictions imposed on visiting sailors. This northern coastline is probably the most remote and challenging part of the Great Lakes. It is wilderness, pure and simple. Distances between urban centers with facilities are significant. Fuel is simply not available outside of a few ports nand even then, it will have to be trucked in or carried in jerry cans. Any parts required for repairs will likely have to be shipped in, to a community not easily accessible. Repair and maintence facilities are scarce or non-existant. The same applies to provisioning sources, healthcare services, banking and even communications. So, whats the attraction? That very same remoteness! This area is little changed from the time of the voyageurs. The scenery is simply spectacular. There is a palpable sense of isolation in the midst of magnificent vistas. 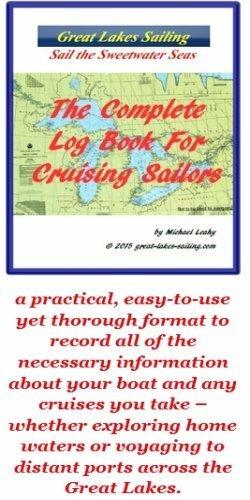 Many of the numerous small anchorages and coves have been in use for hundreds of years by native peoples, voyageurs, explorers and fur traders. You may be alone as you cruise these waters but you sail in the wake of many people before you. Marathon itself does have a variety of services but all at a 1-2 mi/2-3 km walk from the harbour. Historically a pulp and paper town, Marathon is also situated on the edge of the the Hemlo goldfields, the largest such gold deposit in North America. The approaches to Marathon Ontario are clear from all directions. As you approach the natural harbour, you will see Hawkins Island with a Fl WHITE light. Regardless of the direction from which you are coming, leave Hawkins Island to your port, making sure you stand well off from it. Enter the harbour between the island (on your port) and the mainland. As you enter the harbour, follow the shoreline to arrive at the commercial coal dock. There are no facilities dedicated to recreational boats in Marathon Ontario. You can tie up along the paper mill company's dock. However, you must check in with company security when you do so. (The company is no longer operationg and its property is secured.) If you want to use a taxi to go into town, you must meet it at the edge of the company property. This is more of an issue if you are returning with provisions as security will not allow a taxi onto the property. As well, you cannot have fuel delivered to the dock OR brought in with jerry cans. Your only option here is to move over to the launch ramp where you can anchor. Jerry cans of fuel can then be ferried by dinghy to your boat. As with many more remote small ports, if someone has a problem ask around - people will help out and put you in touch with the right people. There are no repair or maintenance facilities in Marathon Ontario. There is a Canadian Tire store and a Home Harware where you may be able to source some parts if necessary. There are several small grocery/convenience stores in Marathon. Independent Grocer is a large grocery store located in the town. There a Bank of Nova Scotia with counter service and ATM's. Wilson Memorial General Hospital (807) 229-1740 is located in town. IDA Pharmacy (870)229-1670 is located in the downtown. Marathon has the usual range of fast food and family restaurants you would expect in a small town. Consider Oar House Family Restaurant for Italian cuisine or Wok With Chow for Chinese. Station 4 and Rovers Return are two local pubs with standard pub fare. Marathon Ontario is mostly a stopover location if you need fuel or provisions. Obviously, the surrounding wilderness offer ample opportunities for hiking, fishing and simply enjoying this remote part of Lake Superior. There is also the Marathon Ontario municipal website which may give you some ideas on getting the most of your visit.